fills bags with slag wool, manure, tobacco, oilcake or other material, weighs, secures mouth of bag when correct amount bagged, by sewing or otherwise; carries, etc., bags to store; sometimes specifically designated, e.g. cake bagger (oilcake), tobacco bagger. counts finished bolts, and packs them in bags for delivery; in small works, sometimes combines this with work of shaker (279) q.v. packs goods (which have usually been compressed beforehand) in bales, either by hand, or using a treading or baling machine; sometimes also packs bags or sacks by hand; sometimes further designated, e.g. waste paper baler. packs several reams of spoiled paper in a parcel with brown paper and string, without aid of hydraulic press. puts band of paper round bundles of straw plait, reams of paper, envelopes, post cards, etc. ; gums ends together by dabbing with brush; often further distinguished, e.g. envelope bander, post card bander, etc. a packer q.v. engaged in sticking paper bands round edges of tins of boot polish, by hand, or by feeding tins of polish to machine which automatically bands them. a packer q.v. engaged in binding lead piping with straw, and sometimes also in packing it in crates, etc. minds a hand lever operated machine which rolls tapes or other smallwares from bobbins on to a wooden centre or block; keeps machine supplied with bobbins, removes rolled tape. fills bottles, by hand or machine, and passes them forward for labelling; sometimes also inserts cork or stopper, and seals it; often further distinguished according to article bottled, e.g. blacking bottler, scent bottler, sweet bottler. lines wooden boxes with paper; labels box, and attaches lace paper edging. packs goods in wooden or cardboard boxes; for additional work often performed, see packer; often further distinguished according to article packed, e.g. shirt boxer, blue boxer (or box hand), metal polish boxer; cf. boxer, chocolate. boxes finished chocolates in layers, between sheets of paper, or in rows separated by paper wrappings. places cakes, tubes and pans of colour into artist's colour box; pastes labels on to indicate colours; puts in brushes, palette, bottle of linseed oil, and dippers, i.e. pans for mixing colour; wraps box in paper and places in cardboard carton. see boxer ; often further distinguished according to article packed, e.g. blue box hand, polish box hand. (ii) by gas-heated, belt-driven, magazine-fed branding machine; places case boards in magazine, adjusts machine to take required size of boards and starts-up machine so that boards pass through automatically. counts fish hooks into packets and wraps them up. (sacks and bags) counts sacks or bags into bundles of specified size; sometimes combines this with work of tier q.v. ; (paper and board making) as for packer. see tier (iron strip or hoop). a packer q.v. who puts caps on lids or cartons of liquid blacking, metal polish, etc.,; usually also tightens cap, although this is sometimes done by cap tightener q.v. a packer q.v. who screws lids on bottles of metal polish. ties, stitches, strings, or otherwise fixes articles on cards for retailing; often further distinguished according to article carded, e.g. comb carder, hook and eye carder. gathers needles in hand clamp and sticks points into a piece of cloth attached to paper wrapper. makes up boot or shoe laces into bundles of a dozen pairs, and secures them with twine. fills bags, tins, boxes, bottles, cartons, etc., by hand or by machine, with finished articles for sale; sometimes specifically designated according to nature of article or of receptacle, e.g. bag filler blacking filler, box filler, case filler, metal polish filler, packet filler, etc. places finished matches into inners of boxes by hand, and pushes filled inners into box cover; sometimes done by slider q.v., cf. nesting hand (matches) (499). a filler q.v. attending a filling machine; places bottles, etc., on tray and tray into position on endless belt feed; regulates flow through filling nozzles and keeps these clear of obstructions. labels pots, etc. ; ties parchment covers on tops of jars or bottles of jam, cf. tier, jam; sometimes also does work of wrapper q.v. 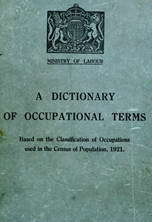 general term for any worker engaged in boxing, labelling, and parcelling black lead. see tinfoiler ; sometimes specifically designated, e.g. typewriting pad foiler. places small linen patterns on bed of gimping machine and turns handle so that edges of cloth are gimped (pinked) by cutting rollers, to prevent fraying; arranges number of patterns and mounts in appropriate position, using wire, metal fasteners, etc., on pattern card. wraps boxes or plates in paper, and glues paper in position. weighs finished golf balls to ensure that none exceeds maximum weight; wraps them in paper, and places them in cardboard box. bends pliable iron bands round packing cases, and makes them fast by nailing them to case. folds finished garment, wraps it in paper and places in box ready for despatch; if necessary, inserts studs, or ties necktie round collars. labels goods for despatch under direction of packer q.v. affixes labels either to goods themselves, e.g. reels, bundles of tape, bundles of pencils, or to bottles, boxes, cases, cartons, casks, jars, etc., containing goods; sometimes fills in particulars on label, or addresses blank label before attaching; sometimes also does wrapping up and tying; sometimes specifically distinguished according to article labelled, e.g. bobbin labeller, bottle labeller, metal polish labeller, sheep dip labeller. takes bottle from rack and places in cavity of labelling machine connected with bottling plant; moves lever controlling automatic feed of labels and damping and fixing apparatus; removes labelled bottles and replaces in rack. minds machine which automatically bends cut pieces of wood to form, respectively, inner match box and outer cover, and which pastes blue paper on inner slide and label on cover; inserts into machine spools of paper as required, fills paste boxes and presses cut wood into slide feed. wraps finished cutlery in waxed papers, and acts as final passer, returning defective articles for correction. put lids on tins, cartons, etc., by hand, after they have been filled. lines wooden boxes with grease proof paper, and helps generally in packing of margarine. lines packing cases with paper or other material, usually merely placing sheets of paper in cases; normally done by packer q.v. ; cf. liner, packing case (sheet metal) (264). attends machine which automatically weighs tea, fills and labels packets for retail sale; inserts paper rolls into machine for cutting into wrapper shapes, and labels, and replenishes paste troughs used in sticking-on labels to packets, cf. packer, tea. (ii) general term to cover workers making up and packing goods, e.g. boxer, packer, wrapper. puts finished handkerchiefs in bundles of twelve; ties them up; presses them in a hydraulic press, ready for parceling; sometimes also ornaments them (see ornamenter) and boxes them. slips or pulls umbrella cases or covers on to finished umbrellas; attaches tassels, and packs in boxes; cf. maker-up (416). marks bales, bags or boxes with stencil or other marks indicating nature of contents, destination, etc. ; cf. stenciller. places chalk or other marks on cases, indicating weight of contents, destination, etc., in preparation for branding. sticks labels on packets or boxes of hosiery. nails lids on wooden boxes or cases, either by hand or, when operating a power-driven nailing machine, by placing box beneath plunger and depressing treadle lever; cf. packer. nails up packed boxes of galvanised sheet, and secures them with metal strip. puts finished cardboard boxes one inside another, ready for despatch. examines, counts, and folds handkerchiefs; ties them up in an attractive manner, ready for boxing, and ticketing; sometimes also puts them in fancy boxes and tickets them. is in charge of a number of machines operated by cigarette packing machine attendants q.v. ; makes necessary adjustments to machines. (ii) places goods in bales, barrels, boxes, cases, cartons, orates, or other receptacles, adding, if necessary, straw, sawdust, wood wool, or other shock-absorbing material; secures bale, case, etc., by nailing, cording, or other means; sometimes also brands or marks oases, or performs other subsidiary processes thereupon; sometimes specifically designated according to class of article packed, branch of industry, or method of packing, e.g. case packer, cop packer, export packer, chocolate packer. places empty tins, for filling, on a belt which carries them automatically into packing or filling machine; or removes filled tins after they have passed under orifice of machine; sees that machine is running correctly and remedies any slight defects; cf. filling machine attendant. arranges biscuits in tins, according to a definite pattern; inserts sheets of paper, where necessary, to separate different kinds or layers of biscuits. a packer of butts, i.e. a superior quality of leather; stacks leather into piles and ropes-up; or places in canvas wrapper and stitches together wrapper ends; sometimes also packs offal; cf. packer, offal. receives from office staff, list of orders for clog soles; selects soles in pairs, fastening them together by nailing to a strip of leather; cuts out these leather strips; packs soles in bags, labelling latter with sizes of soles therein. packs cops, i.e. yarn wound on cardboard, etc., tubes, in skips and cases; fetches and weighs empty skips, etc., examines ticket on set of cops before packing, to see that quality and fineness of yarn are correctly described, and enters particulars of size and weight of packed cope in notebook for wages purposes; wraps in paper and makes up skip for despatch after packing. opens cases of eggs, and examines for breakages, etc. ; sometimes inspects eggs against electric or other light to eliminate bad eggs; repacks eggs into new cases, with fresh wood wool. is in charge of packing department, directs packers and loaders q.v. and is generally responsible for packing and despatch of goods. minds machine which fills bags with weighed amount of meal or flour; fastens sack mouth to machine chute; moves lever to start-up machine; removes filled sack, ties-up and stacks; occasionally checks weight of filled sacks; cf. packer, flour (grain milling) (449). covers hats with paper and packs in cartons, for placing in stock, or, for packing by rough packer q.v. (iii) packs margarine in large quantities, in bulk packing room. (ii) (milling) a packer of bran and other offals; fastens sack to chute from offal container (opossor), moves lever to allow offal to fall into sack; stops flow of offal when sack filled, removes and weighs sack to ensure correct amount therein, ties-up and stacks sack. receives cartons from light packer q.v. or from warehousemen (940) q.v. and packs them in crates. (ii) folds-down open end of filled packet and pastes-on label by hand, using paste brush; cf. machine attendant (tea packing). arranges teazles, clipped and sorted, in layers in wooden boxes for despatch to cloth manufacturers. (ii) (usually female) stitches compressed bales of paper in sackcloth. receives garments from workrooms; sorts them into bundles of similar garments, sizes, etc. ; marks them, and despatches them to destination. places clogs in racks, according to size, for storage; packs clogs for transport; sometimes combines this with work; of polisher (429) q.v. , and of clasper (429) q.v. packs sheets and blackplates in bundles, binds round with iron hoops, links ends of hoops and hits flat with hammer. one of three or four workers who attend automatic cigarette packing machine; feeds packing machine with cigarettes or with cases, labels, or shells and slides or places packets, when filled, in boxes. a wrapper-up q.v. engaged in wrapping cotton piece goods. wraps goods in paper, usually in preparation for subsequent packing in boxes, cases, or other substantial coverings; sometimes specifically designated according to class of goods papered, e.g. clay tobacco pipe paperer. places fishhooks, on gut, in wrappers and envelopes. lines tins with oiled paper, in preparation for packing; sometimes also assists in packing. makes up goods, usually already wrapped, into parcels for despatch; usually in retail quantities or in quantities not requiring packing in cases, etc. ; sometimes specifically designated, e.g. black lead parceller, blue parceller, lead parceller. threads a number of printed sheets of labels over two pins, utilising hole on each side of each sheet; hands sheets thus threaded to guillotine cutter (548) who is thus able to cut labels in true alignment for use in blue, starch, etc., packing. engaged in wool stapler's warehouse; puts-up wool into canvas wrappers, by suspending canvas at corners from a beam, treading down raw wool in centre of canvas, pulling wrapper taut and temporarily fastening with two-ended hook, sewing-up canvas and removing hook. rolls up sheets of finished pins, after they have been stuck by pin sticker (279) q.v. secures coiled ropes by passing thinner rope through centre and round outside of coil, and then fastening. collects, arranges, folds, tickets, and pastes or sews into books, handkerchiefs intended for samples. receives boxes, filled with matches by box filler q.v. , and slides or pushes them into covers made by slide machine attendant (499) '(q.v. ). puts goods in position in a hand-stamping machine, and moves levers, thereby bringing down stamp and affixing trade mark or other distinguishing mark to goods; fits into position, screwing, unscrewing, etc., dies, as necessary. sews up overlapping joints of canvas wrappers of bales, with packing needle and twine. stitches up canvas lining of skips which have been packed with yarn. assists packer (944) q.v. by placing straw between articles to be packed, and by placing ware in convenient position for packer. a packer q.v. who makes flat pads of straw covered with paper for use in protecting woodwork, metal frames, etc., from damage in transport. assists press bundler (943) q.v. on bundling press by tying up bundles. puts paper strips round tins or blocks of boot polish, black lead, blue, etc., as for bander; sometimes specifically designated, e.g. blue stripper. rolls up delicate wool, silk, etc., cloth on tambours, i.e. wooden frames covered with paper, places tambour in holders in winding machine, wraps end of cloth and paper wrapping round tambour and switches-on power drive so that cloth and protective wrapping are wound simultaneously; cf. tambourer (Lancashire) (407). puts tape round made-up textile goods (sheets, pillowcases, etc.) or after making-up, cf. maker-up (943), so as to hold them together and to avoid creasing. sometimes specifically designated, e.g. bobbin ticketer. ties up goods in preparation for despatch; work closely similar to that of parceller or of wrapper q.v. ; sometimes specifically designated according to article tied, or nature of packing, e.g. bag tier, bale tier, firewood tier, ream tier, shirt tier-up, etc. packs blocks of blue in calico bag; places calico into mould, inserts blue, gathers calico to form bag and ties ends of bag with string. sticks 25 gutted fishhooks in a cork, for foreign markets, and ties shank ends together with twine. ties up bundles of scrap with wire after folding, in iron or steel strip or hoop mill, for return of metal to melting furnace. ties covers and wrappers on bottles or jars of jam with string. wraps textile piece goods in tillot cloth (a special glazed waterproof cloth) for export to certain foreign markets; wraps canvas around outside and secures by sewing. wraps cocoa, chocolate, liquorice, etc., in tinfoil, by hand or by feeding, and watching working of automatic machine; sometimes specifically designated, e.g. chocolate, cocoa, liquorice, typewriter ribbon tinfoiler. puts perforated metal cap inside neck of tin bottle containing black lead or other similar goods, in liquid or powdered form, to facilitate sprinkling. puts labels on unprinted tins of black lead paste. arranges empty tins on trays, which are conveyed by endless band under nozzles of polish filling machines; sometimes done by filling machine attendant q.v. folds and closes up packets of needles by tucking in ends of wrapper. ties up clog irons in six-pair bundles, with wire, for storing or for despatch. wires up, by hand, cans of petrol, benzene, etc., and seals them by affixing a metal seal on wire and cap. (v) (jewellery) wraps piece of jewellery in tissue paper and puts it in case, usually velvet-lined, ready for despatch; sometimes also wraps case in paper; sometimes specifically designated according to class of article, e.g. black lead wrapper, cake wrapper, chocolate wrapper, cop wrapper. wraps umbrellas or parasols in paper, and boxes them; sometimes also does work of umbrella looper (429) q.v.